The Lakeside Ranger District plans to burn The Show Low polishing ponds, weather permitting. The prescribed burn is in cooperation with the Arizona Game and Fish and the City of Show Low and will be approximately 15 acres with minimal smoke impact. Smoke may be visible from Arizona State Highway 77, U.S. Highway 60, Show Low and Linden. The prescribed burn location: Marsh burn, located three miles north of Show Low on the west side of Arizona State Highway 77, near Telephone Lake (T10N, R22E, and Section 5). 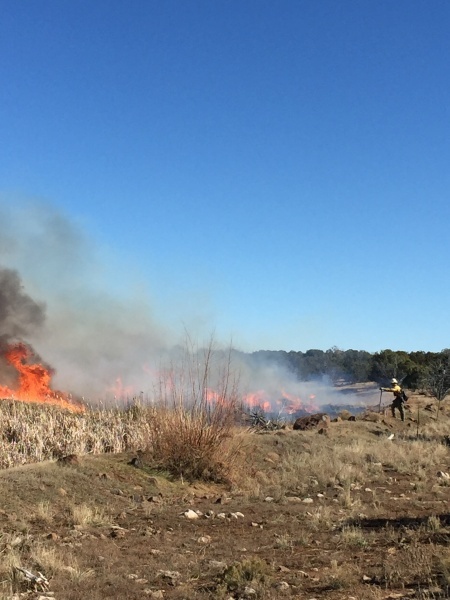 The prescribed burn will reduce dead fuels, stimulate new growth of wetland vegetation, and improve wildlife habitat and maintenance of the wetland and riparian ecosystems near Pintail Lake. All prescribed burns are approved through the Arizona Department of Environmental Quality (ADEQ) before ignitions begin. The ADEQ monitors air quality and determines whether or not it will be a good day for smoke dispersion. Breaking larger burn areas into smaller acreages often limits the amount of smoke that impacts an area. Although smoke from prescribed fire can still be a nuisance, it is usually for a shorter time and considerably less smoke than wildfires produce. If you are sensitive to smoke or have respiratory problems, stay indoors if possible. Crews will be on scene from the beginning of ignitions until there is no longer a threat of escape from the project boundaries. Questions or concerns, please contact the Lakeside Ranger District (928-368-2100), the Northeastern Arizona Public Information System (311 or (928-333-3412) or the Supervisor’s Office (928-333-6280). You may follow us on Facebook (Apache-Sitgreaves National Forest Facebook at facebook.com/apachesitgreavesnfs or checkout our webpage: www.fs.usda.gov/asnf.